January 24, 2019, VICTORIA, BC – Aquara by element, a $88-million aging-in-place senior’s residence in downtown Victoria, received its Development Permit this week as Mayor and Victoria Council voted unanimously in favour of the project. Element Lifestyle Retirement Inc. (TSXV- ELM), the manager of development and operations of Aquara, announced that Aquara is launching previews of offerings immediately, and launching pre-sales and rental reservations within the coming months. The residence will be completed in 2021. Element Lifestyle (Vic Harbour West) Inc. (“Vic Harbour”) – a wholly-owned subsidiary of Element Lifestyle Retirement Inc. (TSXV- ELM) – is the General Partner of Aquara Limited Partnership, the property owner. Known for its innovative intergenerational aging-in-place model, Element began its community consultation program to garner feedback from prospective residents and their families in June 2018. It has been working with focus groups to sharpen and refine its proposed services and activities for its aging-in-place community. Open-minded, collaborative planning and innovation are the key approach Element Lifestyle Retirement takes when rolling out each of their three unique retirement communities – Opal, Element’s $106 Million Flagship residence in Vancouver, Oasis, a $200 Million residence in Langley and Aquara. Photo caption: Rendering of $88 million aging in place seniors residence, Aquara by element. 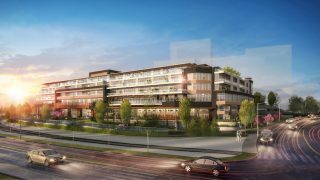 Located on 1.96 acres by the harbor of the Songhees neighborhood in Victoria West, Aquara will stand 5 storeys tall within Bayview master planned community amidst high rise residential towers, a park, and retail amenities. The 153,500 square foot residence will include approximately 30,000 square feet of indoor and additional outdoor terrace, patios and rooftop garden for residents. Aquara includes a vibrant mix of activities, some tailored to the elderly and some designed specifically to bring together all ages. Element’s branded intergenerational aging-in-place model recognizes that society benefits as a whole when there is integration of all age groups. Stress is reduced as adults maintain a demanding career, provide for their children and help their retiring or aging parents live to their fullest. 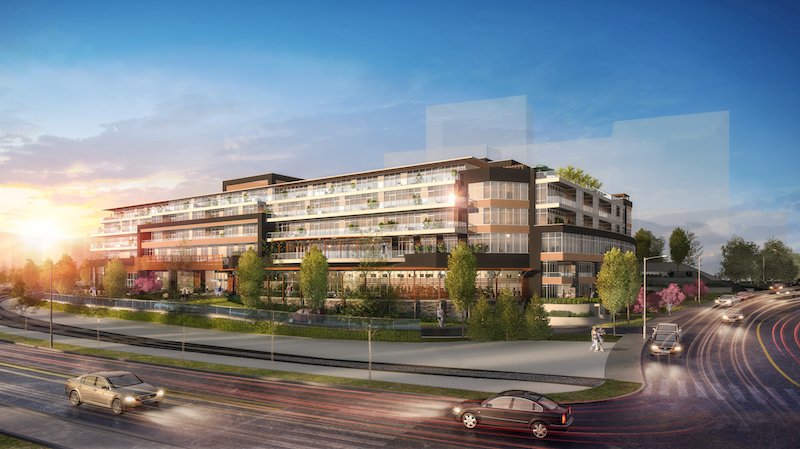 The proposed community will contain 160 units, with 125 Independent and Supportive Living suites available for purchase or for rent, and 35 units providing Licenced Care in a designated, secure area with its own tailored amenities and activities. It is anticipated that the construction costs will be financed through a combination of debt and limited partnership funding. The Aquara Discovery Centre at 110 – 645 Tyee Road is already open to the public. Victoria residents can preview suite layouts ahead of launch of pre-sales and rental reservations. The Discovery Centre features a show suite specifically designed with physically adaptive features accommodating aging in place. A report released in March, 2018 by Generation United, states that 74 per cent of survey respondents believe in the benefits of intergenerational housing, lifestyles and programs that allow older adults/retirees to directly connect with the wider community to share skills and talents (Source). However, the report states many people don’t know where it is possible to find such facilities and program. Aquara will provide a complete continuum of lifestyles – from active, independent living to assisted and complex care. Element’s intergenerational approach to creating community residences that overcome the stigma of the “old folks’ home” is internationally recognized. In 2015, Element won the ‘Globals Award for World’s Best Senior-Focused Intergenerational Master-planned Community Design’. In November 2018, Element’s flagship, OPAL by element, was visited by an Australian retirement living international tour, to be studied as one of Canada’s top innovative models.